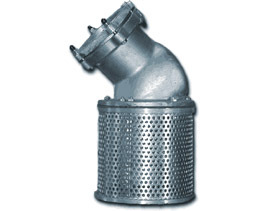 Combining an attachment coupling, a 45 degree elbow, a foot valve and a strainer, this Aluminum Foot Valve fulfils every requirement. A half inch female pipe thread is provided for drainage. Made entirely from aluminum except for the bolts, rubber gaskets and valve flapper, this valve is light in weight yet sturdy and efficient. Available with stainless nuts, bolts, and washers. Ample space is provided for the valve flapper to get out of the water stream, and the full size opening means minimum friction loss.